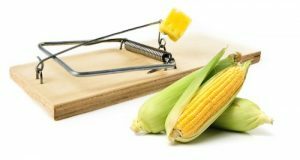 When You Eat THESE Common “Trigger Foods”… Your Bones and Joints Go Under “Microscopic Attack”… And That’s Why You Hurt! But recent research shows the foods you eat every day have a massive impact on inflammation, joint pain, and your overall quality of life. Scientists say the root cause of almost all chronic pain is due to bacteria in certain so-called “healthy foods” that can trigger increased inflammation around your spine and joints which causes continual pain. However, these pain-triggering microbes can now be largely under YOUR control – and quickly eliminated from your body by using an anti-inflammation diet! You see, bacterial joint inflammation is a serious and painful infection in a joint. It’s also known as bacterial or septic arthritis. Bacteria can get into your joint and cause rapid cartilage deterioration and bone damage. This can lead to significant pain, swelling, redness, and loss of movement. And that bacteria in the food you eat is the primary cause of inflammation of the spine and joints … inflammation that results in your chronic pain. Inflammation is NOT the devil. In fact, it’s a natural part of the healing process your body needs for recovery. However, toxins in our environment and changes to our food and water irritate and injure our cells and tissues. The body overcompensates and we get stuck in long periods of inflammation. And this is what leads to chronic pain. Too much inflammation that fails to shut off naturally is the single biggest source of your chronic pain. Therefore, when you’re in a state of chronic pain, one of your main goals should be to reduce “stuck” inflammation – so it quickly fades as nature intended. Now, I know when I mention “changes to your eating” you might immediately think of strange fad diets, weird exercise routines, or meals that consist of nothing but rice cakes and tofu. But none of that stuff is realistic — or even effective! In fact, some folks remove just one thing from their diet and their pain vanishes! It’s no different than those who suffer from heartburn and indigestion. They don’t have to change their entire lifestyle. They simply avoid the foods they know cause inflammation. And for some, eliminating just one “Trigger Food” — your hidden source of pain — can bring about fast healing. Banishes Your Chronic Pain in 30 Days – GUARANTEED! As an advocate of cutting-edge alternative health ideas, I’ve made it my life’s work to help others reclaim their wellness through easy-to-follow methods such as the one I’m going to tell you about. This book is much more than just another cookbook with a few recipes and shopping lists. This book will give you the knowledge you need to identify what is keeping you in pain and show you how to rebalance your system, reclaim your health and finally feel better. Imagine… knowing the exact source of all the types of your pain. Ask yourself how much easier life would be when you know you’re treating the source rather than the symptom. Imagine… waking up ready for the day instead of popping yet another painkiller and waiting for it to kick in … or wondering whether this will be the day an accidental opioid overdose chokes you into unconsciousness. Imagine… never feeling like a burden to loved ones who have to help you live with the pain. Most importantly, my new guide to eliminating pain through better nutrition gives you the knowledge you need to identify what is keeping you in pain – and show you how to rebalance your system, reclaim your health, and finally live pain free! 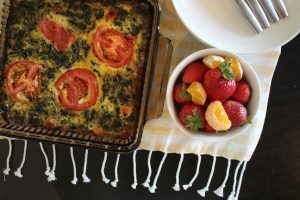 My goal in creating The Live Pain Free® Cookbook was to give you a guaranteed path to getting out of pain fast. And to do it without dangerous drugs, risky surgery, expensive rehab, or other methods that waste your time and money. Let me be clear: While The Live Pain Free® Cookbook includes dozens of easy to make, delicious recipes, it also helps you identify the specific trigger foods you need to avoid if you want to get rid of your chronic pain for good. Although the source of every person’s pain is different, the concepts I offer in the book are scientifically proven to help all types of pain. They’re also easy enough to use at any stage of your pain cycle and start seeing major results in just days. easily put an end to your pain – for FREE! You can break the pain cycle. The Live Pain Free® Cookbook shows you how faster than you ever thought possible. And is 100% effective when followed as laid out in my manual. What other treatment offers you this kind of assurance? And it’s not just freedom from pain where you’ll notice a difference. The Live Pain Free® Cookbook is based around my groundbreaking Complete Healing Formula™. Gives you greater stamina and energy. But is it simple? Yes, it was written to be extremely easy to follow, but I’ll be honest… living pain free requires some commitment. 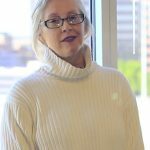 I have worked with thousands of people to help them live pain-free lives. I know what works and what doesn’t. So trust me, if I didn’t think this method was doable for the average person, I wouldn’t recommend it. 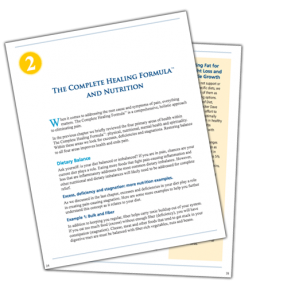 I personally guarantee that doing everything that’s laid out in my Complete Healing Formula™ and The Live Pain Free® Cookbook is a much easier and effective option than dooming yourself to a life of unending pain and misery. I’ve done everything I can to make it practical and powerful. The top 10 inflammation causing foods. Some will shock you because they’ve been labeled “healthy” foods for years. I expose them ALL in Chapter 2.
you’ll absolutely LOVE this program! I’m not asking you to change your lifestyle overnight. In fact, I’m not asking you to change your lifestyle at all, unlike some other systems and fad diets out there. They’re impossible to stick to and that’s why they don’t work. I know if I had to choose between all my favorite foods and chronic pain… the choice might not be so easy. Instead, I want to give you an easy way to see once and for all that living in pain is not normal. While we will all experience pain from time to time, consistent chronic pain (known as suffering) is something no one should ever have to accept in their life. Doctors may tell you your pain is “chronic and progressive.” And that the best you can hope for is to manage it when it’s at its worst. Instead of treating the source of your pain, they give you nothing but short-term solutions. So, as long as you’ll give me the permission to do so, I’d like to put my Live Pain Free® program in your hands absolutely FREE! Once you get your copy of the book, you’ll be immediately introduced to The Complete Healing Formula™ on page 17. You’ll find everything you need to know about the 4 Pillars of Balanced Health so you can immediately begin to rid yourself of the imbalance that is locking you in pain. Be prepared to see immediate results. 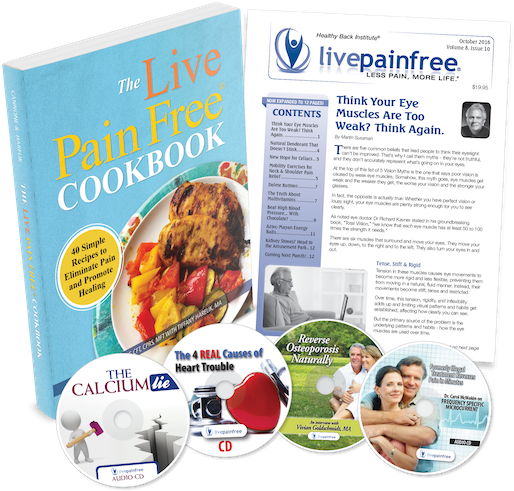 You’ll have everything you need inside your copy of The Live Pain Free® Cookbook. Live Pain Free® – Yours FREE – my gift to you! 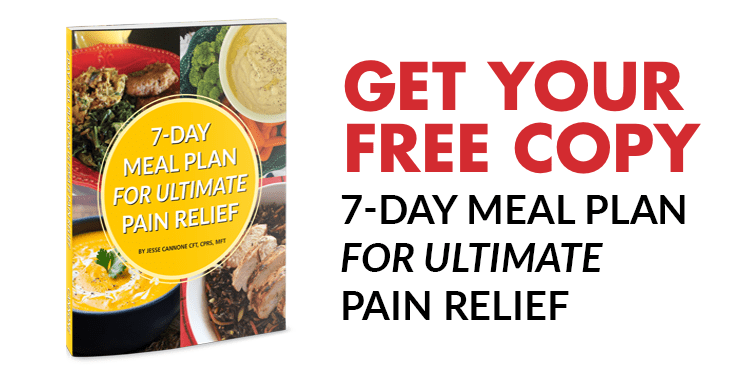 Claiming your copy of The Live Pain Free® Cookbook ebook is both simple and FREE. All you have to do is accept my offer of a no-risk, 30-day trial subscription to my Live Pain Free® Health Letter. The revolutionary pain-relief newsletter, one of the first of its kind, is your way to escape the propaganda of Big Pharma and the medical establishment – and your key to a lifetime of pain-free living! 4 ways to reduce pain by gaining greater control of your negative emotions. How to reduce brain inflammation by eating a delicious spice used in some Indian foods. 10 quick tips for stopping your eye from twitching. How better posture can help unclog your sinuses – as odd as that sounds. Simple steps you can take to stop your feet from hurting throughout your day. Easy ways to get rid of ugly and potentially dangerous varicose veins. 10 things you should do at the start of every day … for the rest of your life. Fall asleep more easily by wearing this headband. Why you should NOT take Metformin for type 2 diabetes—even if your doctor says otherwise. Get rid of unsightly cellulite – without liposuction. And dozens more – all at your fingertips on our members-only web archive …..
remedies the mainstream media won’t touch! The Live Pain Free® Health Letter is something I’ve put a lot of energy and passion into. 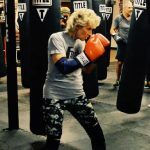 It gets the full attention of my team of experts here at the Healthy Back Institute® (HBI) … and our goal is helping you banish ANY kind of pain you might have. You get all of my natural, holistic pain-healing experience as the founder of HBI … along with the wisdom and knowledge of my medical advisory board of 7 doctors and pain specialists. Plus, not only will you get access to our rapidly growing global community, you’ll also receive the most up to date strategies, research, and in-depth product reviews so you know what works — and most importantly what doesn’t — BEFORE you try it yourself. You’ll get it all from my team of top doctors and researchers who have dedicated their lives to finding lasting solutions to all kinds of pain. Just look at all you get! You might look at this list and immediately think … wow, all that valuable material must be worth a lot of money! And if you were to add everything up, the retail value would in fact be over $1,800. But you’re not going to pay even close to that amount when you become a subscriber. yours for just 50 cents a day! 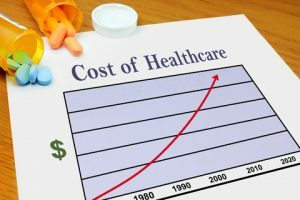 A recent national medical survey showed that individual yearly medical expenditures among adults with back and neck problems were in excess of $6,096! And that’s only the financial costs. Chronic pain is one of the biggest thieves of your time. Especially in your retirement years. 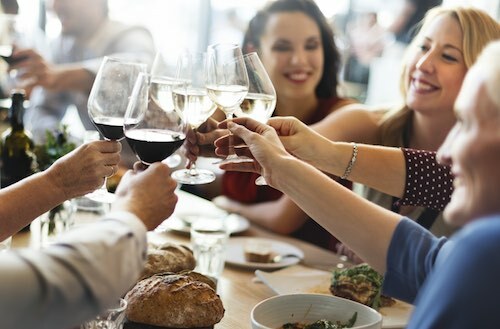 It steals away days spent with family – and robs you of the time you should be spending enjoying your best years. With that said, we could easily charge $1,800 or more per year for the Live Pain Free® Letter – and it would still be less than a year’s worth of chiropractic treatments. But as I mentioned before, you won’t pay anything close to that. The costs researching and producing the newsletter are divided among all of our subscribers. This allows us to offer it at the lowest price possible. Just enough to cover our expenses. …I’m offering you membership in our service for only $14.95 per month – less than 50 cents a day! And that’s only after you’ve had one month FREE to review your first issue and apply all the pain-relieving secrets you’ll discover. straight from today’s top pain specialists! One of the things we constantly get great feedback about is our monthly audio interview – delivered on CD as well as digitally. Every month, I personally sit down one-on-one with some of medicine’s brightest minds. That interview is recorded on an audio CD (and sometimes as video on DVD) and sent exclusively to our members every month. 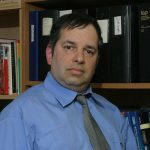 When it comes to pain and the elimination of it, the doctors and pain professionals I interview are on the cutting edge. You’ll get access to some of the most innovative and successful specialists in the world. Doctors and award-winning researchers you may never hear about otherwise. No guess work here. Just real solutions that work. Plus: Our Disc of the Month interview … members-only Online Archives with 9+ years of back issues … unbiased news … product reviews … success stories … and more! All this is yours with your risk-FREE 30-day trial subscription to my Live Pain Free® Health Letter! And you’ll also get a new issue of the newsletter and a new interview each and every month. Today I want to give you a special deal… a way of saying thanks for putting your trust in us. That’s why I’m offering you everything I mentioned above for just a one-time payment of $4.95 — yes, less than five bucks! 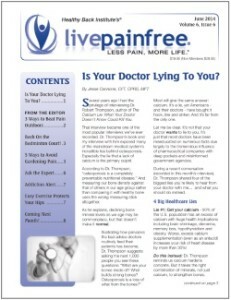 That’s about what it costs us to print and mail you one issue of the Live Pain Free® Health Letter. Now, as I mentioned earlier, getting and staying pain free will always take more than just a book or a newsletter. And honestly, our subscribers who stick with us are the ones who have seen their pain disappear – some with as little as one small change. So to prove you’re serious about giving it a shot, we’re just asking you to cover the small cost of getting it to your door. Just click the link below and confirm your order on our secure checkout page – and we’ll rush your first issue along with The Live Pain Free® Cookbook right away for just $4.95. Once you receive it, you’ll have the entire month to review it and see if it really lives up to the rave reviews of our current subscribers. If you love it as much as they do, then simply do nothing. You’ll be sent a new issue and a new CD every month for the normal $14.95 price I mentioned. But, if you feel it’s just not for you, then simply call us and we’ll cancel your trial subscription immediately. We’ll immediately refund your $4.95 in full – and you will not be charged another dime. 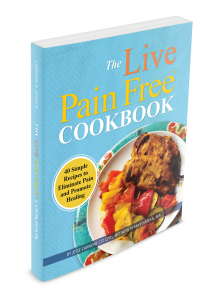 You can even keep The Live Pain Free® Cookbook – yours FREE, our gift to you. That way, you risk nothing. You can’t lose! I’ll Also Send You 2 FREE Bonus Reports…. 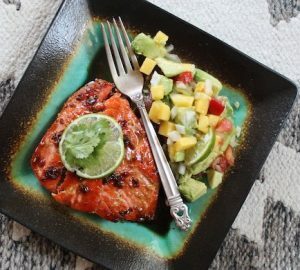 As a companion to The Live Pain Free® Cookbook, we put together an extensive 43-page guide on the best pain relieving foods. Inside, it will show you 1) my 21 favorite foods for quick and lasting pain relief, and 2) how to use each of them in simple recipes. Premium food does not always mean premium health. Grass fed beef, shiitake mushrooms, and wild salmon are all great for your health but not for your wallet. I’ll show you how to get the same nutrition for a lot less. My “Best for Your Buck” matrix of the best pain fighting foods, cross referenced with The U.S. Department of Agriculture’s Food Cost study. See which foods fight pain fastest at the lowest cost. The single most powerful inflammation fighting food you can buy at your grocery store. Once you see the price tag on this food you might have to ask the stock boy if there’s more in back! The 10 absolute WORST foods for inflammation and your wallet. Sometimes addition comes by subtraction and removing some of these foods can soothe pain and save money. 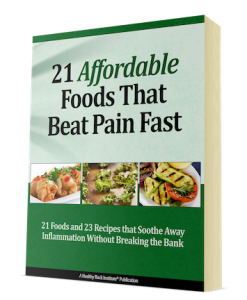 21 Affordable Foods That Beat Pain Fast is yours absolutely FREE when you ACT TODAY. You might not realize it, but pain and excess weight go hand in hand. Sadly, too many of us try to separate our problems and deal with them one at a time. You can combine many of the foods in The Live Pain Free® Cookbook and live pain free while losing weight, too. In fact, a lot of them are the exact same foods which means you save time and money while becoming lighter, leaner and pain free. Trust me, nothing is more deflating than getting out of pain for good just to realize you’ve got another problem to solve. That’s exactly why I’m also including my popular Secrets of Effective Weight Loss in this offer. 5 “cheat foods” that actually help BURN fat! Imagine no more guilt after sneaking in just one extra cheat meal. Learn which of these “bad” foods can get great results. Pg. 13. Being 100% pain free is going to free up a lot of your energy… and dropping weight and keeping it off will allow you to use that energy to be more active. From getting more done around the house to taking the scenic route back to your hotel on your next vacation. 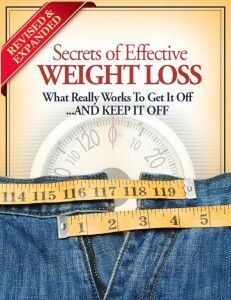 By taking action now, you’ll get The Secrets of Effective Weight Loss absolutely FREE. Get Instant Digital Access in PDF format! 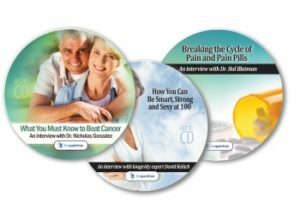 Start reading on any computer or device TODAY, before we ship your Live Pain Free® Print Newsletter and Audio CDs. Your total satisfaction with the Live Pain Free® service is the #1 goal my team and I strive for each and every day. If you ever feel that we’ve fallen short of that mark, or if the Live Pain Free® Health Letter is just “not for you,” then you can cancel at any time, and you’ll stop receiving the service immediately. Cancelling is easy. You can call us toll free at 800-216-4908… or if you don’t want to talk to anyone, you can log in to your “My Account” area of our website and cancel electronically. I think we can both agree that’s fair, because this way, all the risk is off your shoulders and sits squarely on ours, as it should be. 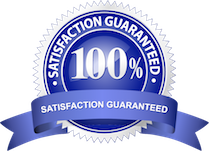 If I miss the mark on anything I’ve promised, you can cancel at any time – without cost or penalty of any kind – and keep all issues, CDs, and other bonus materials you have received, including your free copy of The Live Pain Free® Cookbook! To get started, simply let me know you’d like to be a member of our Live Pain Free community by clicking the order link below. The only charge to your card will be for the $4.95 I mentioned and nothing more. Once you’re inside, you’ll have access to everything I mentioned above, plus the ebook version The Live Pain Free® Cookbook will be emailed to you immediately. Send my FREE Book Now! P.S. — The ebook version is perfect if you like using your iPad or tablet in the kitchen. 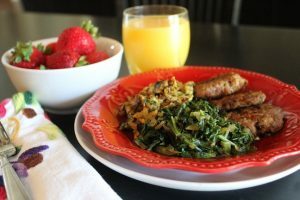 The pictures are vibrant and the recipes are easy to read on your screen. But if you’d like a paperbound book for your home medical library in addition to the ebook, it’s available on the next page. 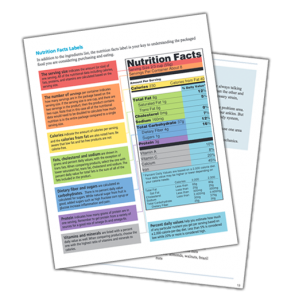 To get your FREE copy of The Live Pain Free® Cookbook, two FREE bonus reports, and your first printed edition of The Live Pain Free® Health Letter, click the order link below NOW. I have been suffering from chronic lower back pain for 10 years. I am really looking forward to seeing the plan you have to offer!!! Thank you for your comment and we would like to help. Please consider getting yourself a copy of our Free book, “The 7 Day Back Pain Cure” . The book discusses back pain and related conditions, pain relief methods, treatment options and other useful information.